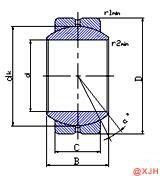 ​The role of the Spherical Plain Bearing COM Series is to support. If the transmission component (such as the square shaft) is directly matched with the hole, the transmission resistance is large, and after the wear, the transmission component is not easily changed. The joint bearing relies on the rolling between the components to support the transmission, so the sliding resistance is small, the power consumption is small, and the starting is easy. The role of the Spherical Plain Bearing COM Series is to support. If the transmission component (such as the square shaft) is directly matched with the hole, the transmission resistance is large, and after the wear, the transmission component is not easily changed. The joint bearing relies on the rolling between the components to support the transmission, so the sliding resistance is small, the power consumption is small, and the starting is easy. 4) Features of structure: With oil grooves and oil holes. Outer race formed by extrusion. 5) Properties: Good wearability, self-alignment. Spherical Plain Bearing COM Series When the outer ring and the housing hole are tightly fitted, the housing can also be heated and loaded into the joint bearing. In particular, in the case of tight fitting of a joint bearing made of light metal, the joint surface of the joint bearing may be damaged by press-in of the outer ring of the joint bearing, and the joint bearing seat should be heated at this time. Always tighten during the cooling process or tap the joint bearing with a small hammer through the fitting sleeve to make it tight. Spirical Plain Bearing COM Series should be slightly rotated during installation to prevent tilting or jamming.